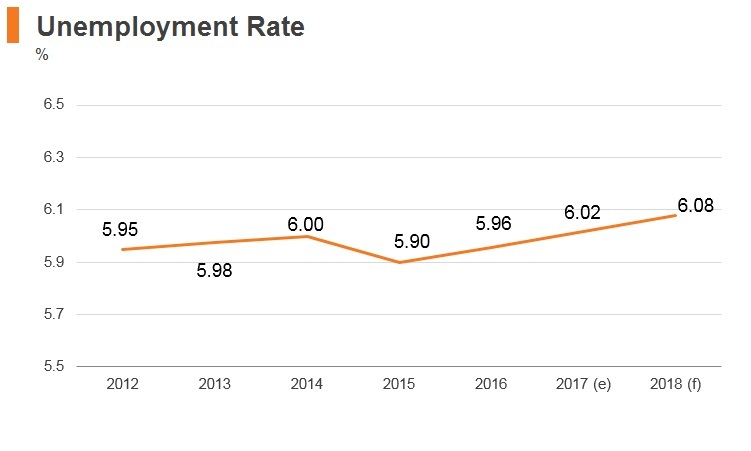 While Pakistan’s growth trajectory remains promising on the long-term horizon, underpinned by its large consumer and labour markets and rising industrial sector, macroeconomic imbalances are widening in the near term. 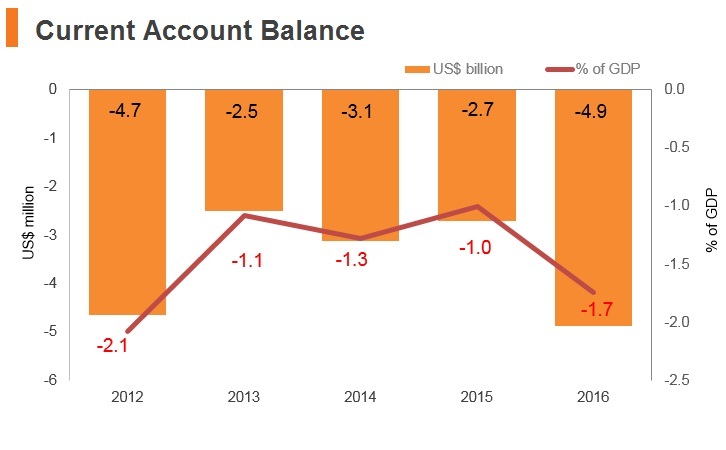 The country’s fiscal and current account deficits will prove to be significant drags on growth in the short-medium term outlook. 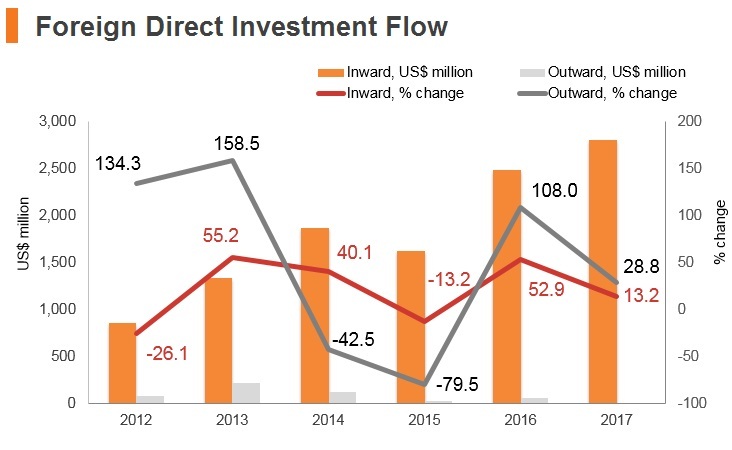 An improving, but unpredictable security situation, difficult business climate, lengthy dispute resolution processes, poor intellectual property rights (IPR) enforcement and challenging tax environment, have contributed to lower Foreign Direct Investment (FDI) inflows, as compared to regional competitors. Prime Minister Nawaz Sharif resigned. 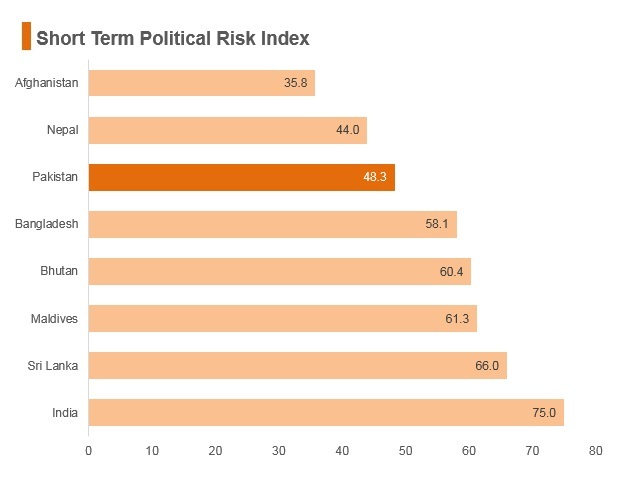 Pakistan had allowed the rupee to weaken twice over the five months leading up to March 2018 as it attempted to patch its weak financial position before elections in July 2018. Former international cricket star Imran Khan became Prime Minister on a pledge to end corruption and dynastic politics, after his Pakistan Tehreek-e-Insaf (PTI) became the largest party in the July 2018 general election. Pakistan became a member of the WTO in January 1995. 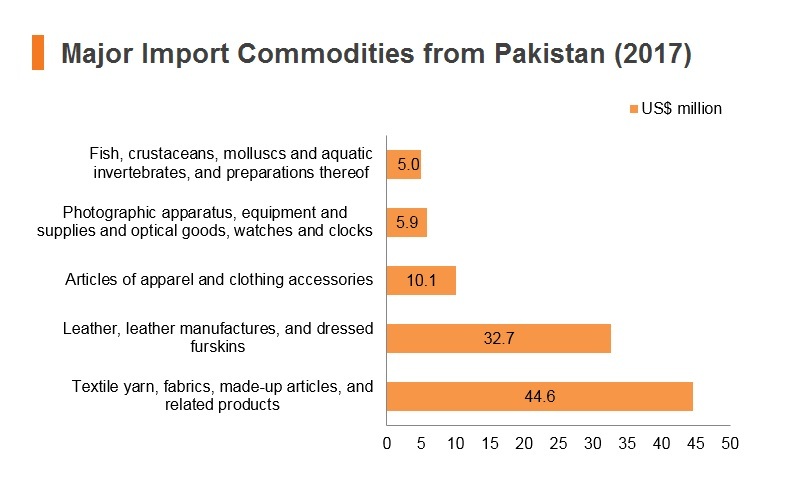 Pakistan's average tariff rate is relatively high at an estimated 8.9%. There are various regulatory duties in place to protect local industries particularly in textiles, agriculture, oil and gas, steel-making as well as autos industries ranging from 10-30% on certain finished products. In December 2015, Pakistan increased the regulatory duty on import of old and used vehicles from 50% to 60%. In March 2016, the Ministry for Industries and Production released Pakistan's Automotive Development Policy 2016-2021 which outlines various import duties for the Autos sector. Import duty on sub components increased from 5% to 10%. Import duty on non-localised Completely Knocked Down kits reduced from 32.5% to 30% and on localised kits from 50% to 45%. Import duty on Completely Built Units ranges between 40%-75%. These are targeted to improve local production. 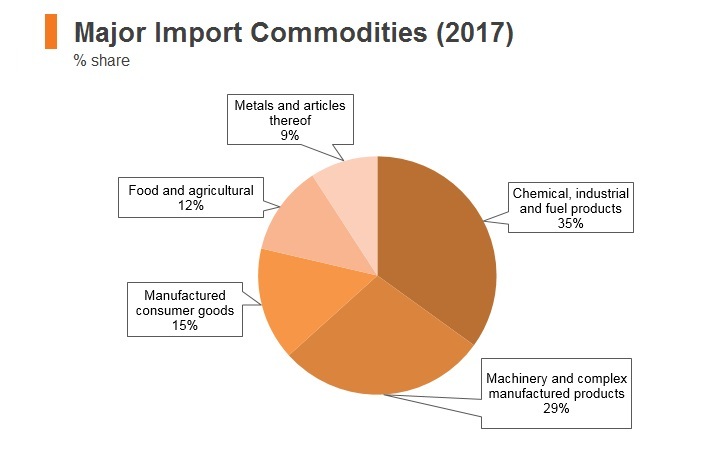 An additional 1% duty has been imposed on all imported products, except certain exempted items, such as all non-dutiable imports, import of agricultural machinery, essential raw materials and agriculture inputs, components for local industry in 25 sectors, such as leather, pesticides, sugar, fans, electric motors; on import of fertilisers, seeds and spores of sowing, telecoms sector, imports under Small and Medium Enterprises and Export Oriented Unit rules, under the temporary importation scheme, import of old and used vehicles. In December 2017, Pakistan's Ministry of Finance, Economic Affairs, Revenue imposed a regulatory duty of PKR4,699/metric ton (equivalent US$ 44.59) on imports of Liquefied Petroleum Gas. This will raise production costs for energy-intensive firms in the country. 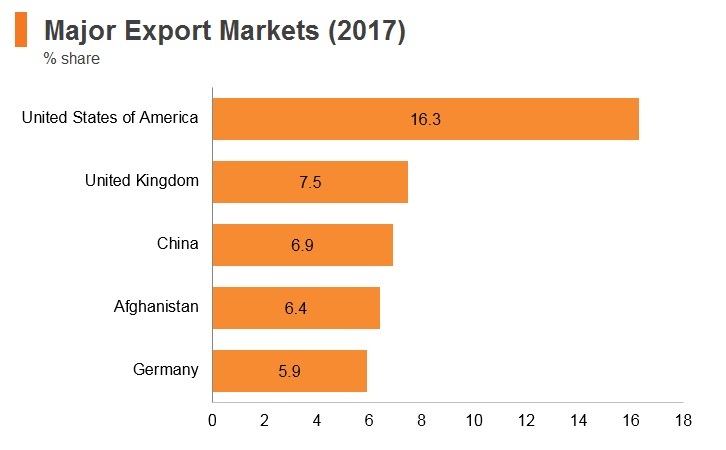 Steel imports are heavily regulated and the country also faces risks from increasing global trade protectionism which could spur further tariff measures in the near term. There are various export duties (around 25%) surrounding scrap metal, some steel products and aluminium waste. There are various anti-dumping duties and import restrictions applied on manufactured goods (particularly those that can be supplied locally). Items such as tiles, galvanised coils and other metal items, textile inputs and chemical products. In January 2017, the government of Pakistan announced an export package to support the textile industry worth PKR180 billion. The policy measures announced include the removal of sales tax on imported textile machinery and the removal of customs duty and sales tax on cotton imports. 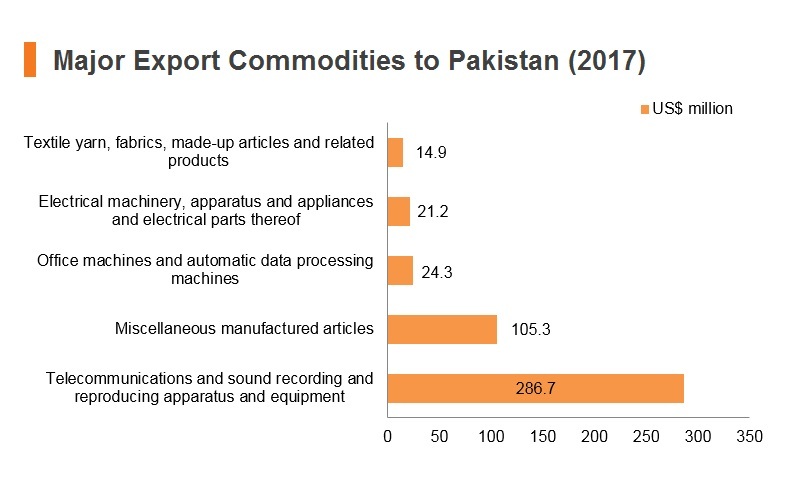 In September 2018, Pakistan and Turkey sought to revive negotiations on a free trade agreement (FTA). Pakistan-China FTA – The Pakistan-China FTA is a major FTA signed between The People's Republic of China and Pakistan. It was concluded in 2006 and entered into effect in July 2007. 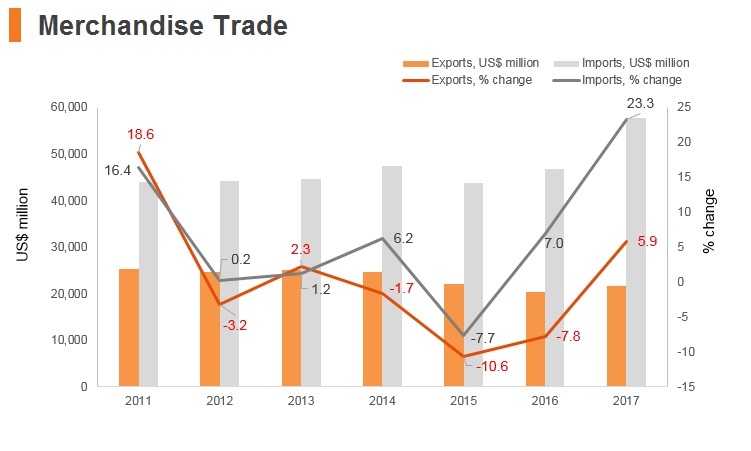 Trade volume due to an agreement between the two states was US$13 billion in 2013, and reached to US$20 billion by 2017 when both countries signed 51 agreements and Memorandums of Understanding (MoUs) for cooperation in different fields. The agreement has to be implemented in two stages. It was agreed that by the end of phase 2 (Phase 1 was completed in 2012), the two sides would liberalise 90% of tariff lines and the trade value. 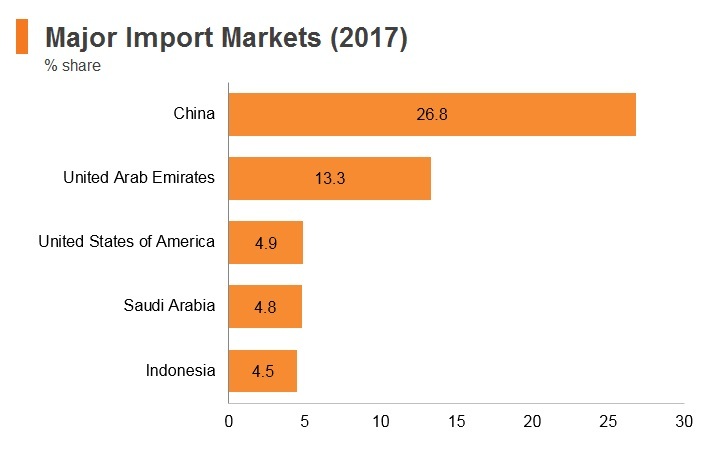 In 2018, China had already agreed to immediately eliminate tariff on 57 priority export items to Pakistan which cover 67% of current exports to China and 32% of global exports. Firms will benefit from the development of the China-Pakistan Economic Corridor (CPEC) that will increase FDI and improve logistical infrastructure. Pakistan-US – The Pakistan-US Economic Partnership will boost bilateral trade and investments and help to sustain economic reforms in the country. 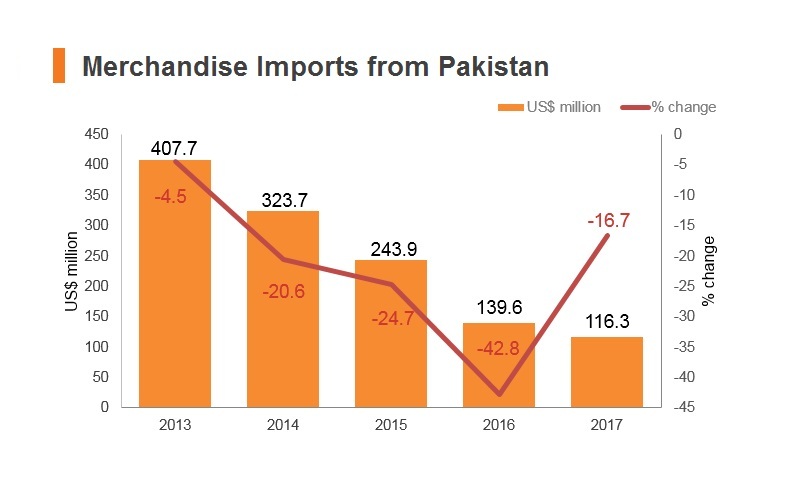 Firms will benefit from increased bilateral trade between the US and Pakistan, which, in 2016, was over US$5.4 billion - out of which exports from Pakistan were about US$3.4 billion while imports from the US are round about US$2 billion. Economic Cooperation Organisation Trade Agreement (ECOTA) – This agreement includes Iran, Tajikistan, Afghanistan, Pakistan and Turkey. This agreement opens up trade between key regional peers and increase industrialisation in the country contingent on greater development of logistical infrastructure and special economic zones. Greater opportunities are now available to firms with the lifting of sanctions on Iran. Mauritius-Pakistan – the Partial Scope Agreement came into force in November 2007. Pakistan-Malaysia – the FTA and Economic Integration Agreement which includes goods and services, came into force in January 2008. Pakistan-Sri Lanka – the FTA came into force in June 2005. South Asian Free Trade Agreement (SAFTA) – The FTA includes Afghanistan, Bangladesh, Bhutan, India, Maldives, Nepal, Pakistan and Sri Lanka. The agreement came into force in January 2006. South Asian Preferential Trade Agreement (SAPTA) – the Partial Scope Agreement came into force in December 1995 and includes Bangladesh, Bhutan, India, Maldives, Nepal, Pakistan and Sri Lanka. Association of South East Asian Nations (ASEAN) – The 10 member states of ASEAN are Brunei, Indonesia, Malaysia, Philippines, Singapore, Thailand, Myanmar, Cambodia, Laos and Vietnam. This will extend the market access of firms in Pakistan and bolster regional trade. Pakistan has signed only one preferential trade agreement (PTA) with Indonesia in February 2012, which became operational in September 2013. The Gulf Cooperation Council (GCC) – Firms would benefit from easier access to GCC markets and greater trade facilitation in light of the country's need for fuel and energy products. Greater investment from GCC states would improve the telecommunications, real estate, energy, infrastructure, ports, aviation, and manufacturing and financial services sectors with increased growth of Islamic banking services. The proximity of Pakistan to the Gulf States will be highly beneficial to firms with greater trade facilitation and the advent of the CPEC. Pakistan's government aims to increase its trade volume with the bloc have also proposed the GCC to consider relaxation in terms of payment of crude oil purchased by Pakistan. Pakistan-Afghanistan-Tajikistan Trilateral Transit Trade Agreement (PATTTTA) – This agreement will liberalise trade between the three states and allow businesses in Pakistan access to Central Asia which will mitigate supply chain risks and stimulate investments. 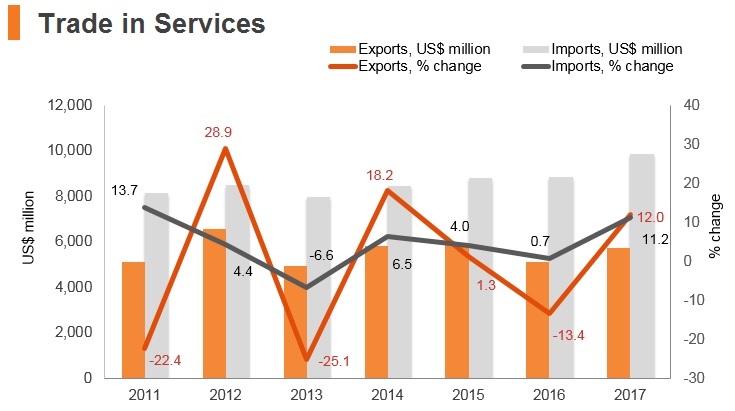 Trade between Afghanistan and Pakistan remains very low due to regional security concerns; however, defence cooperation will help increase regional trade in the medium term. 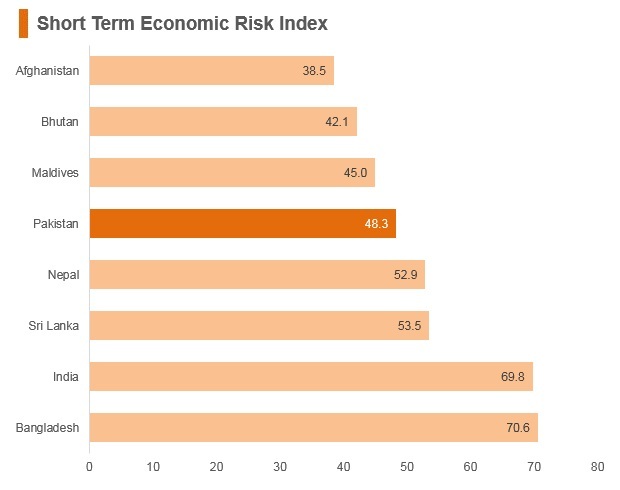 Pakistan is moving towards becoming more open for foreign investment and spearheading the development of special economic zones; however, FDI flows to the country have been negatively affected by the weak security situation and policy uncertainty. 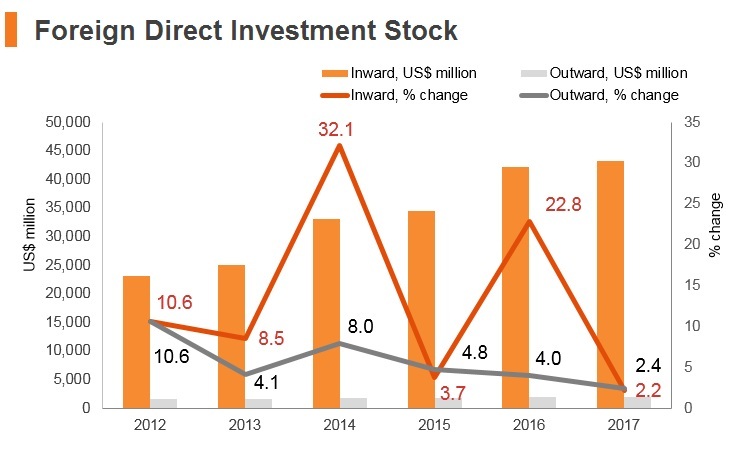 The country remains a difficult environment for foreign investors with chronic energy shortages, high levels of bureaucracy and corruption deterring investors. Pakistan has executed the CPEC, an agreement with China in 2013 that will bring in investments of almost US$50 billion for construction of 3,000 km of roads joining Kashgar, China with Gwadar Port in Pakistan, developing 1,200 km of new rail lines, upgradation of 3,100 of rail lines, development of 21 new power generation projects, development of 40 industrial parks and economic zones, laying gas pipelines, and many more development projects. Most of the work is in progress. The 18 feet deep sea port, on completion, will have 120 berths, and 300 to 400 tonnes of cargo is expected to be processed annually. According to the government, this will add 15% to the GDP of the country, generating five million jobs and impacting the lives of 30 million people. Profits and gains derived from an electric power generation project set up in Pakistan are exempt from tax. Profits and gains derived by a company from the export of computer software, IT services, or IT-enabled services are exempt from tax up until June 30, 2025. Profits and gains derived by refineries, which are setup between July 1, 2018 and June 30, 2023, have been granted exemption from tax for a period of 20 years, upon fulfilment of certain conditions. Low-cost housing projects have been incentivised by allowing a reduction in tax liability (arising on profits and gains) by 50%, subject to fulfilment of certain conditions. Profits and gains from new manufacturing units set up in Khyber Pakhtunkhwa and Baluchistan are exempt from tax for five years if set up between July 1, 2015 and June 30, 2018. Profits and gains from electricity transmission projects are exempt from tax for ten years if set up between July 1, 2015 and June 30, 2018. Income derived by an enterprise set up in ‘special economic zones’ is exempt from tax for a period of ten years, starting from commencement of commercial operations/production, subject to certain conditions. These ‘special economic zones’ have been established in different territories of the country. Profits and gains derived by liquefied natural gas terminal operators and terminal owners are exempt from tax for a period of five years beginning from the date of commercial production. 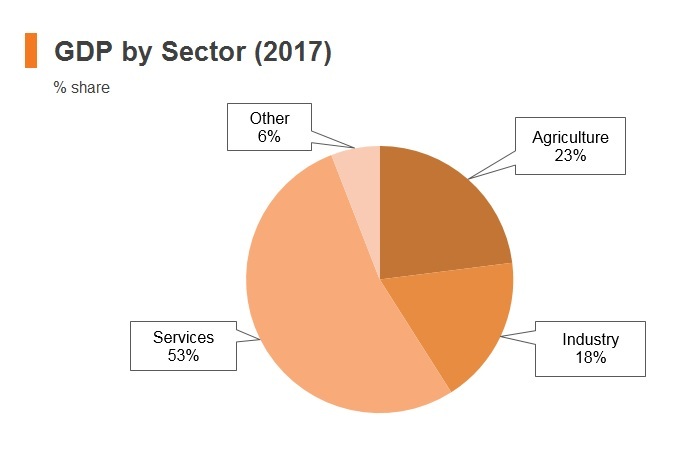 Foreign ownership is permitted with the exception of some sectors designated as strategic in defence-related industries, media forestry and farmland. Foreign banks are permitted to establish locally incorporated subsidiaries, provided they have the minimum global tier-one paid up capital of US$5 billion or they belong to one of the regional organisations or associations to which Pakistan is a member. Absent these requirements, foreign banks are limited to a maximum 49% equity stake in locally incorporated subsidiaries. Foreign and local banks must submit an annual branch expansion plan to the SBP for approval. The SBP approves branch openings depending on the bank's net worth, adequacy of capital structure, future earnings prospects, credit discipline, and the need of the local population. All banks are required to open 20% of their new branches in small cities, towns and villages, which considerably raises operating costs. International transport (mainly air) is restricted to local firms, also foreign ownership in media is capped at 49%. Large and inefficient SOEs have retained a monopoly in a few key sectors, and the state provides annual subsidies to cover SOEs' losses. Three of the country's largest SOEs include: Pakistan Railways (PR), Pakistan International Airlines (PIA), and Pakistan Steel Mills (PSM). Moves towards privatisation have been pedantic. Karachi Export Processing Zone (EPZ), Risalpur EPZ, Sialkot EPZ, Gujranwala EPZ, Saindak EPZ, Duddar EPZ, Tuwairqi EPZ, Gwadar EPZ Developed land on competitive rates for 30 years. Single-window operation with simplified procedures, including the facilitated issuance of import permits and export authorisations. Duty-free import of machinery, equipment and materials (including components, spare parts, and packing material). Freedom from national import regulations. Exchange control regulations of Pakistan not applicable. Repatriation of capital and profits – the Zone is exempted from all provisions of the Foreign Exchange Regulations Act. No sales tax on input goods, including utilities bills. Duty-free vehicles allowed under certain conditions. 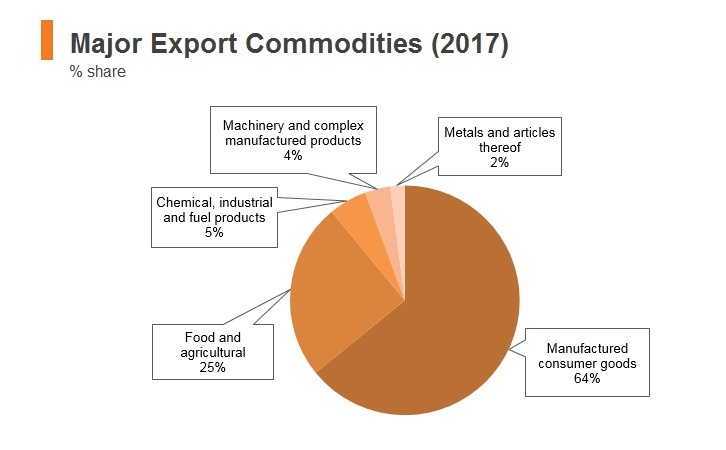 Domestic market available to the extent of 20% of goods manufactured. Exceptions may be available. Presumptive tax at 1%. Only EPZA is authorised to collect Presumptive Tax at the time of export of goods which will be final tax liability. Obsolete or old machinery can be sold in domestic market of Pakistan after payment of applicable duties & taxes. Defective goods/waste can be sold in domestic market after payment of applicable duties, maximum up to 3% of total value. EPZ units are allowed to supply goods to custom manufacturing bonds and indefinite loss carryforward is applicable. Khairpur Special Economic Zone (SEZ) in Karachi The normal incentives for exports as available to projects established anywhere in the country would be applicable to exports from the projects located inside the zone. State-of-the-art infrastructure and efficient design (much is still under construction). Easy access to labour, training facilities and quality logistic services. The zone will provide inherent benefits of essential supporting amenities to small, medium, and large enterprises to grow in a global market place. Zone enterprises have exemption from custom duties on imports of capital goods; income tax amnesty for 10 years to encourage investment in the SEZ in the Pakistan's capital. Investment opportunities with 100% ownership. The generally applicable corporate tax rate of 30% (relevant for tax year 2018) will be reduced by 1% each year until a rate of 25% is applicable for tax year 2023 and onwards. The corporate tax rate for ‘small companies’, presently 25%, will also be reduced by 1% each year until a rate of 20% is applicable for tax year 2023 and onwards. Super tax, presently leviable at 3%, is to be gradually phased out in the case of persons (including companies, other than banking companies) by 1% each year, until tax year 2021. Tax on ‘undistributed reserves’ in case of public companies, has been reduced from 7.5% to 5%. Previously, no tax was payable where a company distributed at least 40% of after tax profits. Such threshold is now being reduced to 20%. Moreover, issuance of bonus shares shall no longer be considered as distribution of profits for the purposes of these provisions. Tax at 5% earlier applicable on issue of bonus shares has been abolished. ‘Fees for offshore digital services’ received by non-resident persons have been made subject to final tax (like royalties and ‘fees for technical services’) at the rate of 5% of the gross amount. 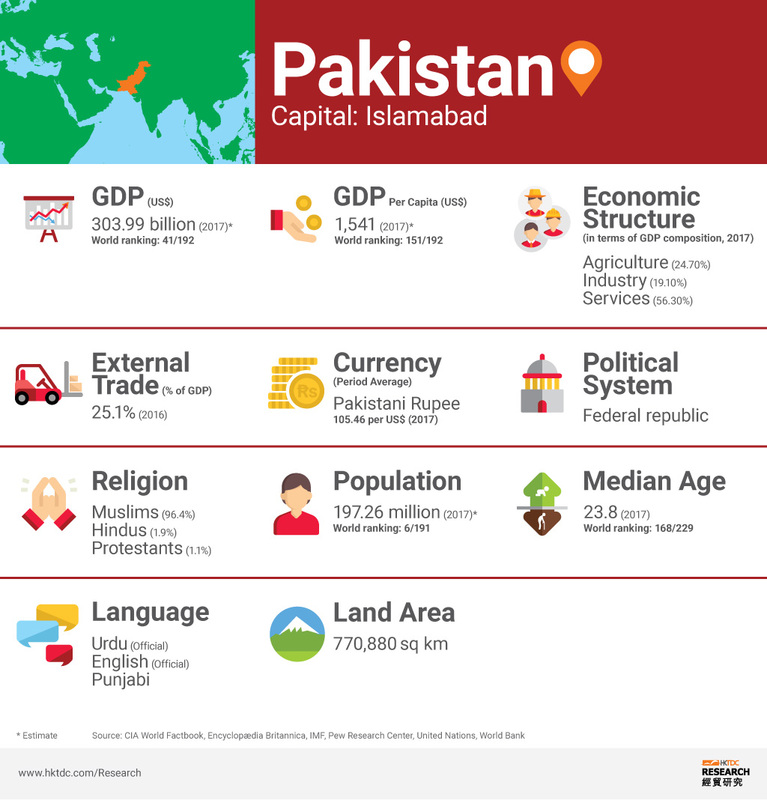 Income from turnkey contracts derived by non-resident persons and their affiliates, that form part of an overall arrangement for supply of goods, installation, construction, assembly, commission, guarantee, and supervisory activities, is to be considered as Pakistan-source income. Under the domestic law, scope of expression of ‘permanent establishment’ (PE) has been enhanced to include (i) fixed place of business used by non-resident persons/affiliates for execution of ‘composite’ contracts and (ii) those persons who are habitually engaged in execution of contracts on behalf of non-residents. The concept of controlled foreign company (CFC) has been introduced with the aim to bring into the tax net passive incomes earned by foreign companies, owned by residents, that are not repatriated into Pakistan. Gain derived outside Pakistan on disposal of a Pakistani asset, held by a non-resident company, has been included in the ambit of Pakistan-source income. Income from services rendered by PEs of non-resident persons have now also been made subject to ‘minimum tax’ (and thus brought on par with resident corporate service providers). Tax authorities have been empowered to disregard an entity/corporate structure having no economic substance or executed as part of a ‘tax avoidance scheme’. Adjustment of unabsorbed depreciation/amortisation against taxable profits of subsequent years has been restricted to 50% of taxable profits in case of profits of 10 million PKR or more. The remaining amounts shall, however, remain eligible for carryforward/adjustment in future years. Gain on disposal of listed and other securities held for more than five years, but less than six years were earlier taxable at 0%; however, now these have been made taxable at 15% (20% for non-filers). The rate of tax chargeable/deductible on dividends received by a company from collective investment schemes, real estate investment trust (REIT) schemes, or mutual funds (other than stock funds) has been reduced from 25% to 15%. ‘Commercial importers’, earlier subject to tax on a presumptive basis, have now been made subject to tax under the normal tax regime, with tax at 5% of the import value considered to be a minimum tax on related transaction. The exemption on income from export of computer software, information technology (IT) services, or IT-enabled services, has been extended to tax year 2025. The tax credit on investment in plant and machinery and newly established undertakings is extended for a period up to June 30, 2021. A one-time amnesty scheme has been announced for declaration of undisclosed domestic incomes/assets by June 30, 2018 for companies on the basis of payment of tax at 2% to 5% (depending on the category of such assets). Minimum Tax on Turnover Where the tax payable by a company is less than 1.25% of the turnover, the company is required to pay a minimum tax equivalent to 1.25% of the turnover. Alternate Corporate Tax (ACT): Under the ACT, the minimum tax liability of a company is the higher of 17% of accounting income or the corporate tax liability determined under the Ordinance, including minimum tax on turnover. Sales Tax on Services Sales tax on services is levied by all four provinces, Islamabad Capital Territory, Gilgit-Baltistan, Azad Jammu, and Kashmir at rates ranging from 13% to 16%. Sales tax paid on services, federal sales tax on goods, and federal excise duty are adjustable against each other, with a few exceptions. Pakistan does not mandate specific performance requirements for foreign entities operating in the country. There is no requirement to hire domestic workers at any grade or have local representation on the company's board of directors. Technical and managerial personnel working in sectors that are open to foreign investments are not required to obtain special work permits. Work visas for technical and managerial personnel are granted for one year and can be extended on a yearly basis. A work visa is required unless a visa abolition agreement exists between Pakistan and the employee's country, subject to the approval of the Board of Investment Pakistan. The process of obtaining a visa and work permits for foreigners in Pakistan is lengthy, taking on average of two months, and is bureaucratically complex. Bureaucratic steps include providing proof of departure, residency status, a copy of the applicant's driving license, and the completion of a Global Service Order Form. Working visas are also expensive, though the cost varies depending on whether it is a single or double entry (up to around US$295) visa or a multiple entry visa for one (US$565), two (US$565) or five years (an estimated US$1,250). However, 37 countries worldwide do not require a working visa in Pakistan, including China, Uganda, South Africa and Iran. No visa exemptions apply to European countries or major Western economies. Pakistan also issues fast-track business visas with five years' validity, to businessmen of 69 countries on the business visa list. Though foreign language skills, especially in English, are becoming more widespread, foreign workers based in more rural areas, will face language and cultural barriers. 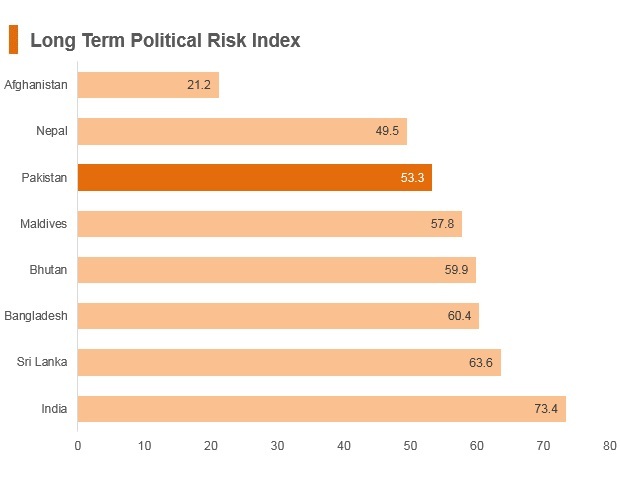 Weak infrastructure and high risk of violence and instability will dent recruitment prospects in the near term. Foreign workers will likely demand high hardship- and danger pay in order to take on the risk of working in the country. Security costs will remain elevated and businesses must employ private security companies to protect their personnel. 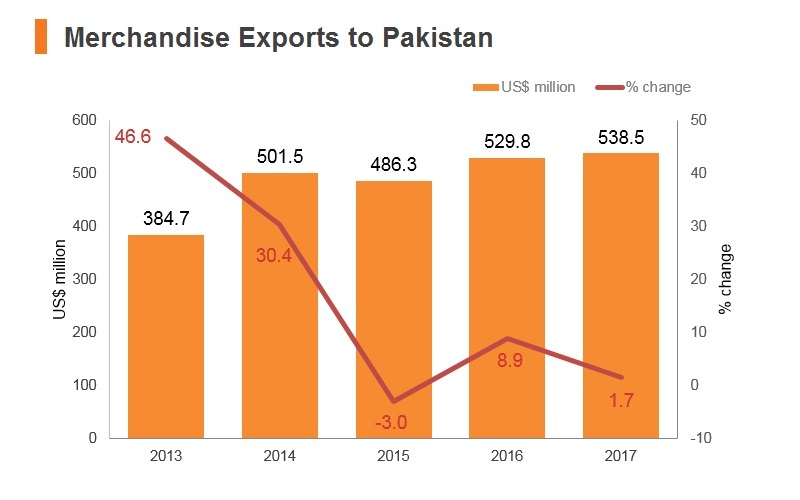 Textiles account for most of Pakistan's export earnings, however gaps in logistics infrastructure hamstring expansion in heavy industries and other energy-intensive sectors, such that the country is considerably exposed to shifts in global demand. However, Generalised System of Preferences (GPS) Plus status granted by the European Union (EU) improved the situation and supports the country’s trade openness. 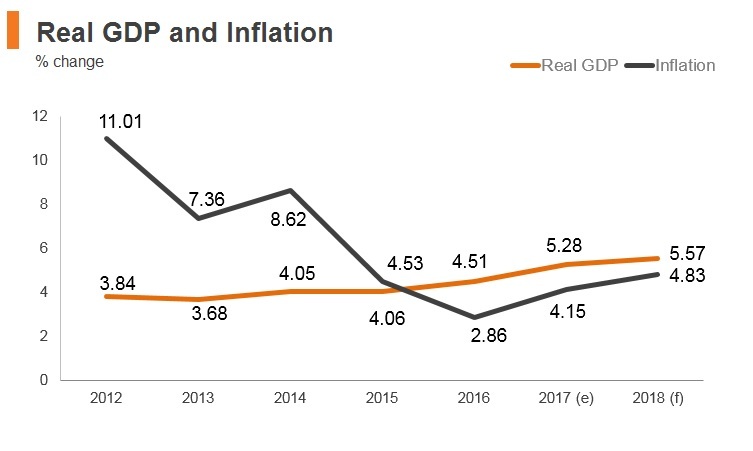 The country’s main long-term challenges include reducing the fiscal and current account deficits, expanding investment, enhancing electricity production, reducing dependence on foreign donors, and improving governance through an improved political system. 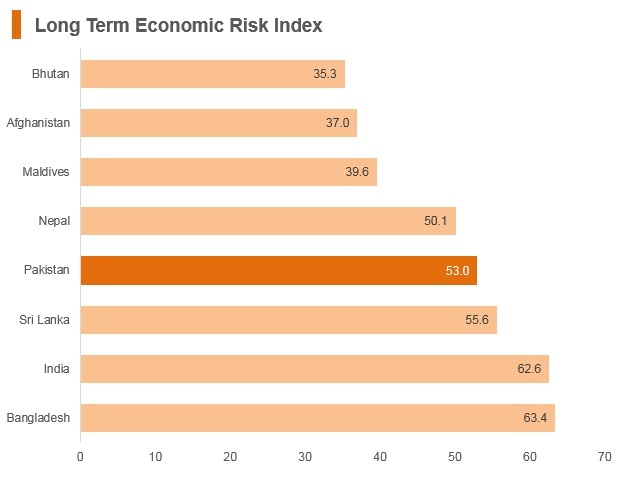 Numerous structural weaknesses, including the recurring high fiscal deficits, low GDP per capita, lacklustre investment expenditure, a heavy reliance on commodity imports, security risks, and financial sector volatility will weigh down the country's growth prospects in the near term. Pervasive corruption and regional security challenges will continue to impede development and social stability in the medium term. Meanwhile, the country's logistics infrastructure is underdeveloped and over-stretched, such that there are frequent interruptions to supply chains as a result of acute energy and water shortages. Looking ahead, the medium- to long-term growth of the country will benefit from the implementation of the China-Pakistan Economic Corridor, which will provide much-needed stimulus to the economy and improve infrastructure capacity in the long run, contingent on significant progress being made in terms of economic reforms and improving the current security landscape. Hong Kong and Pakistan have a Double Taxation Avoidance Agreement which came into force in November 2017. Hong Kong and China have a Bilateral Investment Treaty which came into force in September 1990. Hong Kong residents require a visa when visiting Pakistan.